But when I ran out of brown sugar, I just couldn’t muster it up to go to the store. And I figure other people are in the same boat, somewhere, sometime, for whatever reason. 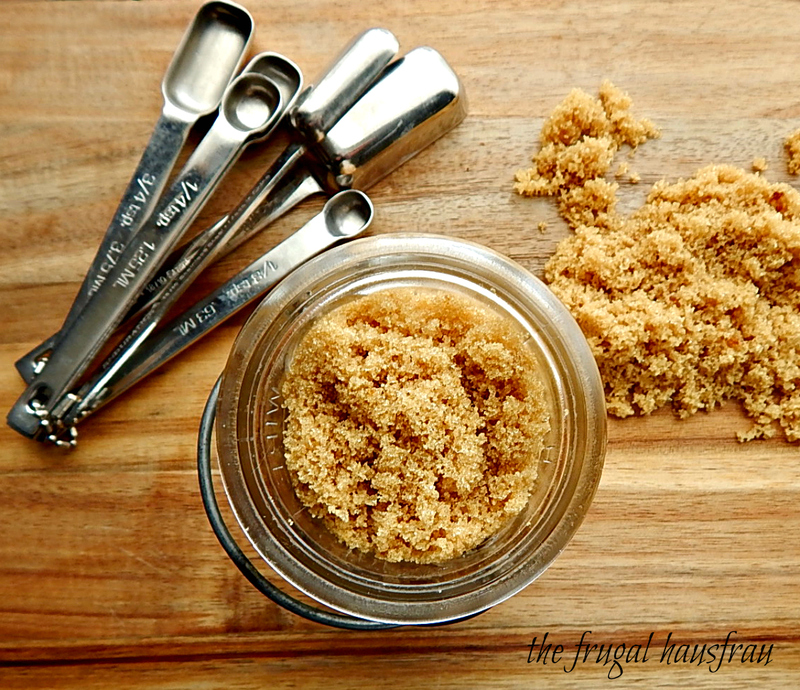 So here’s a super simple method to make your own Brown Sugar. Before you make this, though, know that if you’re making something like cookies, you don’t even need to mix up the brown sugar and molasses. Just add the sugar and molasses right to the recipe. You’ll never notice the difference at all. But sometimes, you do need Brown Sugar. When you start mixing your Brown Sugar, you’ll think it will never come together – it will be clumpy and weird. Just soldier through it, and stop to scrape the pan. After a few minutes, let it sit for several, then do a final mix. Bag it right away because it will start to get a little crusty if it just sits out. But once it’s bagged, it will all even out and soften up. There’s another bonus, it’s cheaper to make your own brown sugar than to buy it, especially if you get a great price on the molasses. Can I mention Aldi, yet again, on my blog? Multiply the quantities, below, for the amount of brown sugar you wish to make. Use the paddle attachment. Mix sugar and molasses together, slowly for several minutes, stopping to scrape down, until the clumps smooth out and mixture becomes almost homogeneous. Let sit for five minutes, then scrape and mix again. Add sugar to food processor, using the blade attachment. Drizzle in molasses while pulsing. Pulse until mixture becomes almost homogeneous, stopping to scrape down. Let sit several minutes, then scrape and pulse again. Bag promptly. If mixture sits out, it can feel dry on the edges; once it’s bagged, it will smooth out. Wow!! I didn’t even realise you could make your own brown sugar!! I love these type of hacks… just what I need to save loong drive to the shops!! 🙂 I’m in Minnesota, and I hate going to the store in the winter, so anything that saves me a trip! Good morning! Thanks for the repost! Wow..I never thought this can be done too. Such a clever idea. I am going to try this. Happy Hoildays!! Check out my new website https://greedyeats.com/ if you get a chance. Thanks! Hi Neha – thanks for stopping by and I’ll check out your site. I had absolutely ZERO idea you could make your own brown sugar. What a surprise! And many times I haven’t had any with a jar of molasses sitting right there in my fridge. Who knew?? Thanks so much for the tip! Oh, yeah, it’s super easy! Since you mentioned it, Molasses doesn’t have to live in the fridge – just a cool, dark cupboard. Just fyi because I don’t know about you, but I have 10 kazillion things in my fridge shelves. Never enough room! Love this!! Such a good idea. Thanks! It saved me a trip to the store. Plus, it helps knock that molasses down a bit…it takes me so long to go through a bottle! I’ve never had to make my own brown sugar before! But this seems super easy to make! Abbey, it’s just a nice little backpocket recipe to keep in mind when you’re lazy like me, lol! No problem, and Merry Christmas! I have been doing that for years when I am out of brown sugar. Thanks for sharing. Many cooks don’t realize that brown sugar is just a some molasses in the sugar. Merry Christmas. I thought it would be handy to have on the blog. 🙂 Not much of a post, I know, but it’s a great hack. Merry Christmas to you, too! Thanks much, and I appreciate you hosting! lol! I hate going to the store this close to Christmas! Very easy, and thank you!